Unique Incidents in my Life and some of My Articles: GOD- Can you feel His presense ? GOD- Can you feel His presense ? A gentle man of age around 55, who is very much talented, came to me and asked, " karthik, you are 21 now, and you are going to complete you double degree. and i feel you are matured now. what you think about god ? you go to temple just for show-off, or you really believe in it?" i just thought for a while. and i replied. "JI, i feel i am not much experienced to answer this question. but i don't have 100 % belief in God. but i do pray because, millions of people, who devote themselves to god are not doing it blindly. they must have experienced some thing. that's why they are believing. i feel that when the time comes i will also experience the real presence of God. But still i felt that my reply did not cover the expectation he was having in my answer. so i started again. i felt that he was also not believing in God. so i Tried to add one strong point from my side about the presence of some Superior energy above all human beings. I shared one important incident which my father told me. In 1986, NASA sent a spaceship called voyager 2. According to statement published by NASA, Voyager 2 reached near mars and took 1000 of pictures. pictures shows that mars was reddish in color and triangular in shape. it was published in all news paper. while my father was reading this news, a navagraha(9 planets) hawan was going on by the side. During the hawan, they will chant the description about each planet. 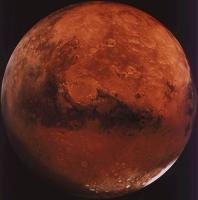 Mars is called as "ANGARAKA" in Sanskrit. while describing about MARS, priests were describing it as, red color and triangular in shape. (i exactly don't no what they mean, when they say triangular in shape. but the word triangle is used in both vedas and in the report by NASA). Can you believe it ? we human beings using technology found that mars is in red color only in 1987. but how the description about Mars is correctly written in our old Spiritual Books which is minimum 200 years old? please think and answer me. This shows there is something above all of us. again, i think i am not much experienced to discuss this serious issue. it is very complex one to conclude. and please correct me if i have expressed some thing wrong. NOTE: I have mentioned that Vedas are minimum 200 years old. but they are 5000 years old, according to both Indian and foreign researchers. but some Indian Researchers still argue that they are even more older. God is termed as Omnipresent. He is everywhere. I want to say something ,I think temple is just a initial to start up with to the real supreme power as i have been hearing and reading for past years. In books they say die while you are alive. After we die no one knows what is going to happen ,you might have read the tamil turikural sorry if there is some mistake . There is also written in the way to god is through human being for what we have been created. God is there in everything he created and things present in this world. i think...God is within us! not some superior being above us. and thts y we have to treat everyone as if they were god. Fo starters, itz a lovely blog... ! probably one of the best ways u can think bout the presence of god is the existence of us. We've all read how fragile the earth is and how even a degree or two hotter or colder would make earth impossible to live in. the way the planets move, they way r body works, the way each biological process is structured - it seems impossible for it all to be a coincidence. thr is surely a designer who started it and whoever he is, he is the Almighty. literally.